As the seasons change, so does the selection of vegetables. We gradually move away from the delicate tomatoes and young zucchinis fresh from the summer sun, as we enter the world of hardy winter vegetables and pumpkin soups with warming curry spices. It is a beautiful time of year when we have time to decelerate, relax, reflect and spend more time in the kitchen, cooking up potfuls of soups and stews. For starters, a thick carrot soup with leftover vegetable stock and herbs de Provence will do nicely. Chances are good that you will have extra to reheat the following day, so that you can spend more time in life doing what you love – staying healthy with home cooked meals all the while. Season the chicken to taste with salt, pepper and half of the Italian seasoning. Place the chicken on a lightly greased baking sheet or pan. 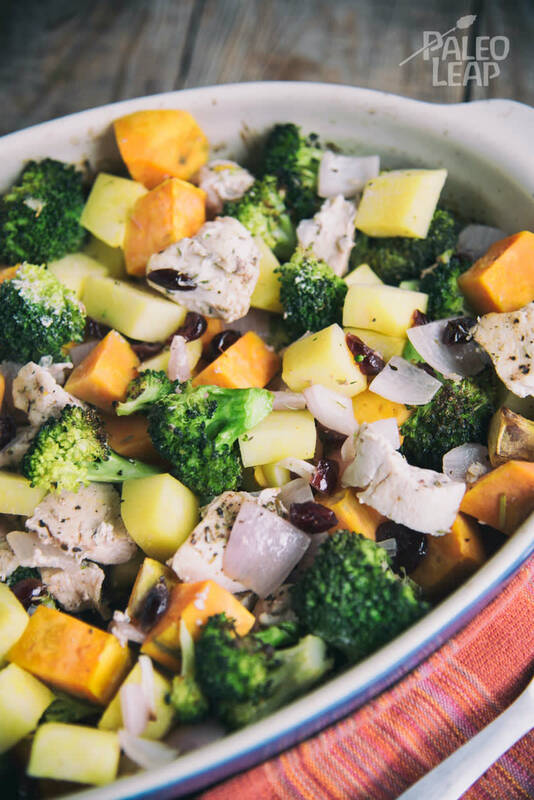 In a bowl, combine all the vegetables and dried cranberries, drizzle with the olive oil, season to taste, and sprinkle the remaining Italian seasoning. Toss until well coated. Add the vegetables around the chicken and place in the oven. Bake for 40 to 45 minutes, or until the chicken is cooked through and the vegetables are tender.